The public is invited and encouraged to attend the final round of public open houses for the Ascension Parish Master Land Use Plan process. The open houses will occur on Tuesday, April 30th at the Gonzales Civic Center and Wednesday, May 1st at Lowery Elementary in Donaldsonville. The open houses will provide an opportunity for residents to view key recommendations from the Draft Master Land Use Plan and discuss comments and questions with the planning team. All are welcome to attend. Please check out the flyer below for more details. Summer 2018: In June, the parish hosted three workshops to collect input from residents in locations across the parish. Through mapping exercises and discussion, residents shared their thoughts on development and visions for the future of the parish. Next, the planning team digitized all the maps from the June workshops, pulling information from each chip placed by residents. Fall 2018: Using the digital results from the map chips and other input, planners created a range of scenarios for growth. These scenarios conceptualize different ways development in the parish could look. In September 2018, the parish hosted two open houses for public input on the scenarios. The results of the scenario open houses support planners in producing an overall vision. 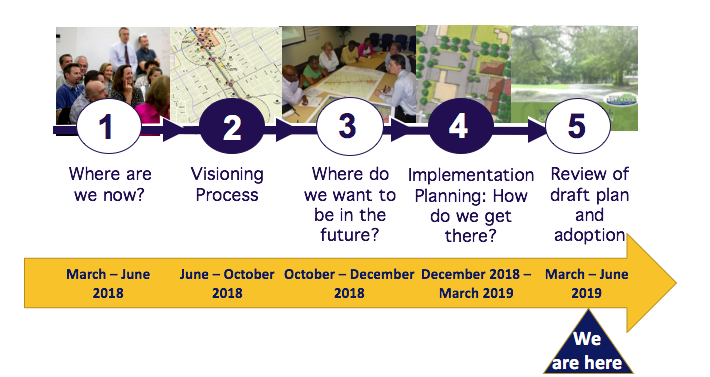 This draft vision was presented for public viewing and feedback at two open houses in late November 2018. Winter 2018: Planners finalized the vision after incorporating feedback and made the materials available on the website. Planners prepared Draft Master Land Use Plan chapters with policies, action and implementation items informed by the vision. Spring 2019: Opportunities for resident feedback on the draft plan continue with two scheduled public open houses. Planners will incorporate feedback from the open houses and from community leaders before the Planning Commission and Parish Council take action on the plan.